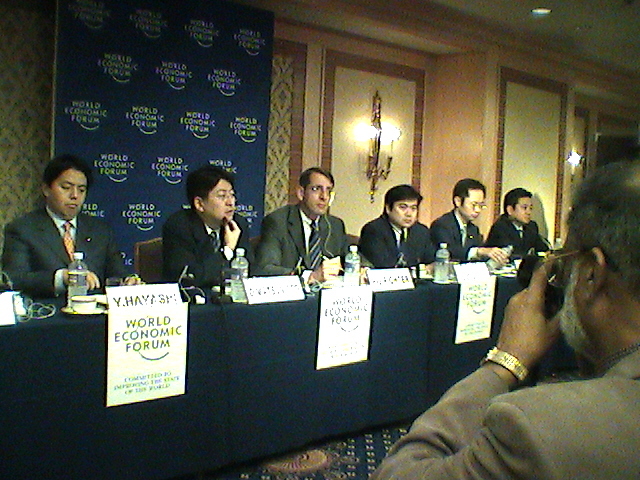 From 4:30pm at Hotel Okura was the press conference for the "Blueprint for Japan 2020" initiated by the World Economic Forum. The agenda fits well with what I am trying to do in "activating" the young leaders in Japan, but on the other hand, it sounds like a lot of work. I'm hoping that it will overlap with what we are doing at Keizaidoyukai. Klaus Schwab is good at getting press so maybe this initiative will provide some exposure of the core issues as well as get some support from outside of Japan to force change in Japan. Following are some quotes from the press release. YOUNG JAPANESE LEADERS JOIN THE WORLD ECONOMIC FORUM TO LAUNCH "BLUEPRINT FOR JAPAN 2020"
"29 August 2002, Tokyo, Japan - The World Economic Forum announces today the launch of its Blueprint for Japan 2020 project created by Professor Klaus Schwab, President of the World Economic Forum, within the framwork of the Young Asian Leaders Initiative. The objectives of the project are to identify and strategize on how Japan should approach its ten most significant challenges in building a revitalized Japan by 2020." "The Young Japanese Leaders who are launching the Blueprint for Japan 2020 include: Business leaders: Joichi Ito, President, Neoteny; Oki Matsumoto, President, Monex; Hiroshi Mikitani, President, Rakuten. Politicians: Keiichiro Asao, Democratic Party; Motohisa Furukawa, Democratic Party; Yoshimasa Hayashi, LDP; Taro Kono, LDP; and Yasuhisa Shiozaki, LDP. Academics: Motoshige Ito, University of Tokyo; and Jiro Tamura, Keio University." "The Blueprint for Japan 2020 will be presented to the 1,000 corporate members of the World Economic Forum at its Annual Meeting 2003 in Davos where young leaders will take into consideration comments from the international political and business communities and further develop the Blueprint." edge and seek prosperity and economic leadership. Integrate Asian Economic zone, one that can rival the U.S, and Europe. Even join forces further with the U.S, so far the sole world superpower, to compete with Asia. But could realize 3 world economic zones: Asia, Europe, and the United States. necessary! Being able to be competitive and stay ahead of tomarrow! population is rapidly aging and the problem of a declining birth rate! The top world economies could end up as by the year 2020. That seriously depends on Japan. 1.China or Japan or the U.S? 3.United States or Japan or the EU? Joi Ito - "Blueprint for Japan 2020" by Joi Ito is licensed under a Creative Commons Attribution 4.0 International License.